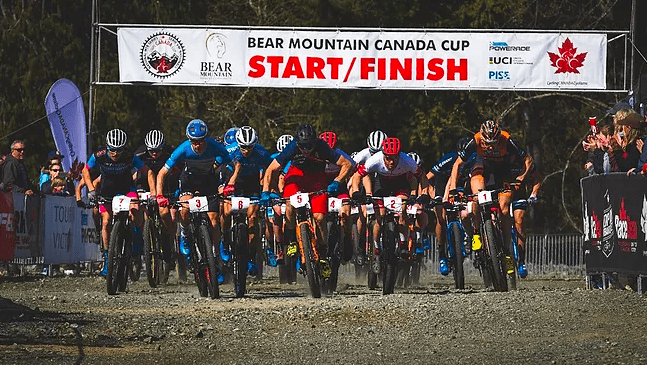 Bear Mountain Canada Cup is back for 2019, and ready to kick of a season of cross country racing that will culminate with UCI mountain bike world championships returning to Canada in August. The Victoria, B.C. venue has stepped into a role as the early season opener for the Canada Cup series over the last few years. It’s location allows for good conditions, if not always warm, while much of the country is still snow-bound. With a spot so early on the race calendar, Canada’s top pros can count on being joined by other international riders looking to stretch their legs and maybe nab some early UCI points in the process. While the cross country course remains the same as in the past two years, with long, single track sections connected by short gravel bits and one punishing steep golf kart climb, Watkin isn’t letting the event stagnate. He’s keen to show how the Short Track event has improved. “We changed the short track course,” Watkin says, making it shorter and more exciting.” While it is a BC Cup event, not Canada Cup, Watkin hopes more racers will take the opportunity to test their legs at the Sunday race now that it has become such an integral part of World Cup weekends. The short format event isn’t just for the elites. Watkin’s enthusiastic about the new relay category for Sunday’s short track, as well as the non-elite categories of the race. Marty’s Enduro is back on the Sunday schedule, bringing high speed and high flying gravity racing together with the fitness fest of the cross country races. As part of the Island Cup series, the shorter enduro course will expand to four stages of racing for experts, with a three stage program set up for beginner races. A new section of trail is being built on the Skirt Mountain side of the venue specifically for the event, to improve one of last years stages. Cycling BC coach Adam Walker, of The Cycling Co. will be leading a Kids Bike Day event again in 2019. It’s a chance for younger riders to engage with the event on the same days as the countries top racers are on course. Last year 68 future riders took part. This year, Watkin expects the event will hit its registration cap of 1oo. Bike demo’s from Norco, Rocky Mountain and Specialized on sight both days and food vendors add to the festival atmosphere, making a weekend of riding, racing and spectating with something, or a few things for everyone to enjoy. Separate from the Bear Mountain event, Watkin says Vancouver Island riders can look forward gravel fondo event this September in the hills surrounding Shawnigan Lake.